When in Moscow, never make the mistake of asking anyone the politically incorrect question of where they’re from. Such a question to a Russian in Moscow carries the implication that he or she is not a sophisticated Muscovite but could actually be from the provinces! That’s right... many Muscovites like to believe that they are different from their lesser fortunate compatriots from smaller parts of the country. In this hierarchy, it’s only those from St Petersburg that manage to get an inkling of respect from the residents of the capital. Many Muscovites have never travelled east of the Ural Mountains and have the strangest ideas of the distant outposts of their own country. 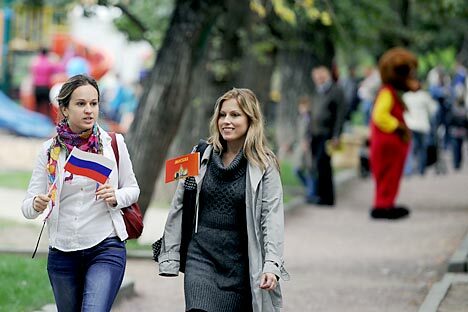 The word “Sakhalin” draws up laughter even in polite society in the capital. “How could you possibly live there for so long,” would be a common question. “Do the people look like Russians or Japanese,” is a close second and “does it snow there in August” is the second runner-up. Such ignorance does not surprise me anymore. We are told that the people that crowd a McDonald’s at the Okhotny Ryad shopping mall are not Muscovites. “Look at their dress sense, their lack of style, listen to their accents,” all indicators of their origins, according to a friend. Muscovites on the other hand go to the fancier shops and pay US$ 100 for a shirt that could be purchased for about a quarter of that price in the United States and still feel that it was a bargain. “Saving” is basically an alien word in Russia’s capital. Muscovites love to burn money on unwanted useless things, unlike the provincials, “all of whom would do anything to live in the capital,” says a proud resident of the capital. It is easy to understand why some Muscovites have such bizarre attitudes towards the provinces. When it comes to holidays, the residents of the capital would be happy enough to go to Europe, Turkey, Egypt or Goa. It is a lot less expensive and time consuming to fly overseas for a vacation than to head to the Asian part of Russia. It’s a 9 hour flight to Yuzhno-Sakhalinsk from Moscow. Now, compare this with the short flying time to any major European city. A one-way ticket to Vladivostok would probably be as expensive as a return ticket to London. Distance and costs aside, most stereotypes are ridiculous. I find myself in the odd position of being the champion of the provinces, especially the Far East. The vastly under-populated region has spectacular natural beauty, cultured towns and cities and in my humble opinion, has preserved genuine Russian culture in a way that Moscow hasn’t for the last 2 decades. The isolation from globalisation has actually helped some of these regions to look more Russian than many parts of the capital. Nothing could be farther from the truth than the myth in Moscow that its residents represent the “cream” of Russian society and that the provincials lack culture. On an earlier trip to the Russian capital, I had to put up with a 2-day barrage of this Muscovite-Provincial talk and found a great opportunity to give it back to my “sophisticated” friends. In a nightclub in the city centre on a Friday night, my friends and I saw a huge blond man dancing in a rather tipsy state. The young man slipped and fell and many of the patrons of the club started laughing. I started lecturing my friends on how mean that was of the Muscovites to laugh at the poor guy. After that hard fall, he gets up and starts dancing again and then falls close to a table and a few pieces of cutlery go down with him. We start to grin. He gets up again and shouts loudly that he is dancing and continues to embarrass himself with his moves. Within minutes of his second fall, he crashes on a table and takes down glasses, bottles and an assorted set of food and drinks. The fall was extremely hard and a vibration is felt, but the room is filled with laughter as people realize that the young man is not seriously hurt. This is my great chance to tell the Muscovites with me that I have never seen such a cartoon character in Sakhalin or in any small Russian town for that matter. Surely, this is not the sophistication we expect from Muscovites, is it? Overhearing our conversation, a woman sitting in a nearby table comes and tells us: “don’t pay too much attention to Sasha…he’s here on holiday from the provinces.” She went on say that he was from Primorye (a region in the Far East)!! If there was ever a point in time that I wanted to strangle someone, this was it. Unfortunately, I ended up losing this battle to my Muscovite friends. For the benefit of my friends in Moscow, I declare that I am a provincial Sakhaliner. When I lived on the penal entrenchment colony, I wrestled bears almost every week, ate reindeer for breakfast and shovelled off snow from the front of my garage in August. Most of my local friends were more fluent in Japanese than Russian. When I wasn’t searching for oil in the tundra, I was partying with my smuggler friends who made a fortune by selling crabs and red caviar to the South Koreans. And in the midst of 4 years, there was 1 day when the temperature crossed 20 degrees Celsius.